(CNN) - With less than two weeks until enrollment closes on Obamacare insurance exchanges, President Obama took his health care pitch to “The Ellen DeGeneres Show” on Thursday, urging moms to get their kids covered and explaining to DeGeneres how different television’s White House is from the real thing. 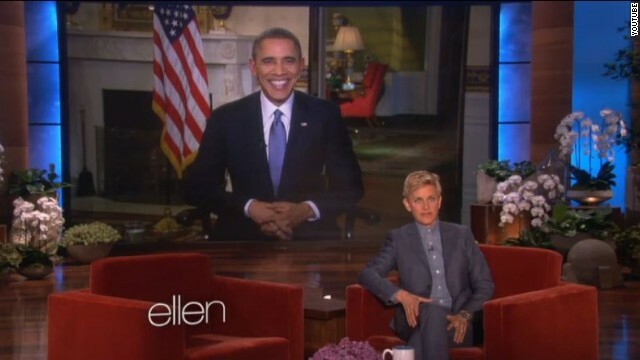 “If you don’t have health insurance right now, you should go on HealthCare.gov and especially all the moms out there who may have young people - 26, 27 - don’t have health insurance but they think they’re invincible and nothing’s ever going to happen to them,” Obama said in a remote appearance from what the host called the “Ellen Blue Room” at the White House. Obama acknowledged how key youth enrollment is to keeping insurance costs down. Responding to a question about why there needs to be an enrollment deadline at all, the President explained that insurers need to know what their customer pool looks like so they can set rates for next year. “The insurers, they’re pricing for a year, and then they need to figure out how many people have signed up, what the risk pool looks like, how many elderly people there are, how many healthy people, how many young people, and that’s how they set prices for the following year,” Obama said, explaining that uninsured people who don’t sign up by March 31 will have to wait until November for their next opportunity. With First Lady Michelle Obama taking the rest of the family on a goodwill trip to China Wednesday, DeGeneres introduced the interview as an appearance from her friend “Michelle’s husband,” who is home alone. “Did you make your bed this morning?” DeGeneres asked, checking in on how the President was getting along in his family’s absence. The President reported that he had in fact been taking care of himself, eating “carrot sticks along with the potato chips,” but the White House is “abandoned,” which means he’s expected to walk the dogs. DeGeneres also apologized for breaking the President’s record for the most retweeted picture in history with her celebrity selfie taken during the Oscars in early March. NAH, Mr. Putin loves being on TV- especially without his shirt on- he'd appreciate the effort. No, what has the Righties upset is the President of the United States found a way to directly talk to Americans without the inevitable spin foreign-owned FOX delivers, or the abject hatred and lies Mr. Limbaugh adds. @rs-Your correct, the GOP has no plan. However, that doesn`t make the ACA good. I would rather have no plan then a plan that makes the situation worse. So basically we have the unhealthy, folks with pre-existing conditions, and the elderly signing up for the ACA. Since the youth really could care less, they aren`t signing up or they are on their parents plan. All this equals to some really high premiums next year. Not just that. What you're going to see is insurers bailing out of the exchanges altogether. This means fewer choices, fewer doctors. And yes, those insurers who remain will jack up their premiums big time due to adverse selection. Bank on it. And if that failure happens will you rejoice? YOU support that failure. Your party supports that failure. Sick, deeply sick! Will I rejoice???? No, my liberal friend, I will not rejoice. Are YOU going to rejoice when the government has to bail out the insurance companies due to massive losses? Because you DO realize that the law calls for that, correct? Or will the bailout be OK because it's a law wholly owned by democrats? THAT is sick. See, here's the difference: the "liberals" you demean worry about actual Americans whose lives are affected by our for-profit health care system- you guys worry about the Insurance companies. See the difference? If you have ever lost a job and had to pay COBRA rates, you would know that hoping Obamacare(s) collapses because the rates are not high enough to support the level of care in the pool, you will wait a long, long time. I paid my ex-company rates, without a company contribution for 18 months at $627/ mo. the current Humana Gold premium. Is $645/ mo without the tax credit(200/mo with the credits at my current income). The COBRA rate is the rate the insurance company actuaries set for the risk pool which includes all workers for the company. Mine was a Fortune top 100. The risk pool was skewed toward middle age and higher from the employees in my office. Bottom line: To think that any actuary is going to short change his employer by under estimating the risk pool, is very naive and borderline foolish. Since, my Healthcare.gov unsubsidized rate is higher than my COBRA rate, it seems the insurance companies will be just fine under the current rate structure, as it appears the actuaries will always err on the side of their employers! "How can you justify spending $2.2 Trillion dollars to sign up less than 5 million people for healthcare?" So how does the "Party of Life" equate the value of Americans lives? What should health care cost? Should it be something only the rich can afford? Jan, what do you hear when you read your post? Guess what I hear? Great start then. How do we fix the American health care system? I know this is hard to understand for you and your Liberal Buddies but it isn't and never has been the per-view of the Federal Government to manage your, the people's lives. I guess you never took U.S. History in School. Believe or not, we have a Constitution ! It is up to you to manage your life! Why can't you do that? Like it or not, the old Liberal Mantra, now en spoused by Whats-His-Name is WITH YOUR MONEY AND MY BRAINS WILL GO PLACES. Old What's-His-Name says he wants to spread the wealth around. Clue: The country has already been doing that for more years than old What-His-Name has been alive. Old What's-Name is out selling Snake Oil. Nero is Fiddleing and Rome is Burning. Time you grew up. I was just told by our insurance broker that our rates would be rising by an estimated 40% next signing period. Awesome. Just awesome. Great point Fair, they say they are against corporations and that all of them are evil but this law only benefits some of the biggest corporations! That makes perfect sense. Similar to the "there is never too much we should spend on our children's education." If you cannot see the folly in spending $2.2 trillion dollars to insure 5 million people - I have another grand policy initiative for you. Let's end the 10,000 of thousands of deaths every year caused by driving accidents, by making the national speed limit 10 MPH. In your "universe" that - along with Obamacare - probably makes perfect sense. Psst. No plan is a worse situation. There are probably more people being denied health coverage under Republican Governrs than there are people who had their policies discontinued because they were not up to par. Conservatives have tossed around 5 million figure. There are roughly 3/4 of a million being denied coverage in Georgia alone. As I have stated before I would be for true socialized health care but if not that, as I stated in my previous post just address the pre-existing conditions, lifetime CAPS, and expand medicaid, this would at the very least be a good start. This is one of the hardest issues in America, I think it would have been better to slowly try and fix it, it is such a huge issue, I don't think it can be fixed with one single bill. Funny, Gundy- I have a graduate degree in American History- and am published. Reactionary, knee-jerk plutocracy is where the Right runs when it runs out of ideas and morality. America was never meant to be about just the rich (despite the rather conservative nature of the original revolution). The wave that follows such flirtations with absolutist plutocratic theory crushes them- usually for about a generation. Hang on- your lack of compassion for your fellow man- and your "I got mine" mentality will bite. Soon. Fair is Fair, you don't need to worry about the insurance companies. They think they are going to be fine. Their actuaries had predicted that the people signing up would skew older, so they took that into account when they set prices for their plans. Not so. I DO, on the other hand, find a potential bailout of insurance companies as unpleasant as I do for any other industry. That "potential bailout" was written by, voted on, and signed into law 100% by YOUR party. WHY would they do such a thing? Did they not know what was in the law until they passed it?